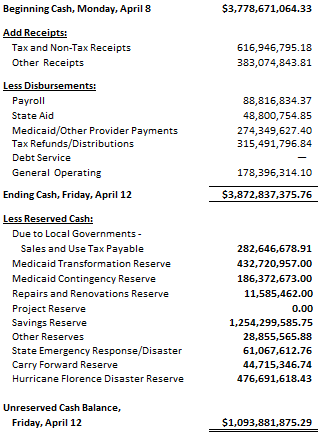 The Office of the State Controller (OSC) today released the General Fund Cash Watch numbers for the week ending April 12, 2019. OSC provides a weekly update on the State’s General Fund cash position which can be found at www.osc.nc.gov. The State Controller is North Carolina’s chief fiscal officer. The Office of the State Controller serves as an independent resource to ensure the financial integrity of the State by providing accounting, disbursing, payroll, internal control, data management, eCommerce, and financial reporting systems that serve state agencies, employees and the public.